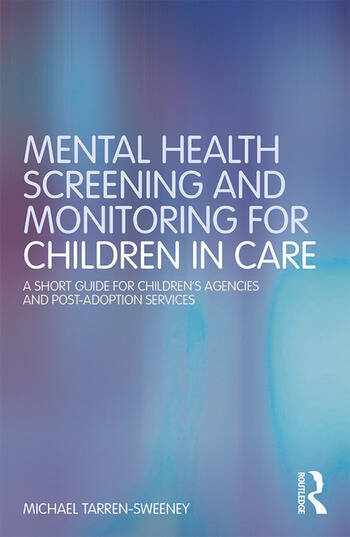 Mental Health Screening and Monitoring for Children in Care provides a concise, step-by-step guide for children’s agencies on how to carry out mental health screening and monitoring for children and adolescents growing up in alternative care. Michael Tarren-Sweeney outlines unique universal mental health screening and monitoring procedures that can be implemented without the need for clinical training or professional oversight. These procedures reliably identify which children should be referred to clinical services for a comprehensive assessment, and which children do not require further assessment. Informed by recent empirical research carried out with children in foster care in Australia and the Netherlands, these procedures screen the vast majority of children who have clinical-level difficulties for a second-stage assessment, including those with attachment- and trauma-related difficulties, meaning that very few such children remain undetected. This book is an invaluable resource for charitable children’s agencies, children’s service providers, statutory children’s services, children’s social workers, and post-adoption support services. Chapter 2. Clinical Interventions and Support Services for Children in Alternative Care (and Their Carers) – Accessibility and Effectiveness? Chapter 3. Brief Assessment, Screening and Monitoring – What’s the Difference, and Does It Matter? Michael Tarren-Sweeney is a clinical child psychologist, epidemiologist, and child developmental theorist. He is Professor of Child and Family Psychology at Canterbury University in New Zealand, and founding Editor of the international research journal Developmental Child Welfare.